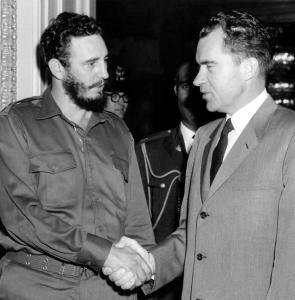 For over fifty years, U.S. and Cuban diplomats, emissaries and intermediaries have met secretly in airport lounges, dingy cafeterias, fancy French restaurants, and posh apartments in locations ranging from New York and Washington to Guadalajara, Paris, London, and Havana, to address the myriad of issues that divide these two perennial adversaries. The history of these negotiations, and the lessons they hold, are especially relevant at a time when both President Obama and President Raul Castro have publicly declared the urgency of moving beyond the legacy of perpetual hostility. Returning to the historic site of the first of the secret negotiations to actually change the framework of what Kissinger called the "perpetual antagonism" between Washington and Havana, the authors of an explosive new book, Back Channel To Cuba: The Hidden History of Negotiations Between Washington and Havana, will reveal the untold details of this covert diplomacy. They will have recently declassified top secret documents on hand to present to the press, and will identify the key secret intermediaries used by Washington and Havana to conduct this diplomacy. The who's who of colorful characters includes a Nobel prize-winning novelist, the chairman of the board of Coca Cola, a leading American television news journalist, and even a former U.S. president. And the authors will share the lessons for Obama as he considers a presidential legacy that includes ending hostilities and improving relations with the Castro government. William M. LeoGrande, professor of government at American University. October 1, 11:00am, The Pierre Hotel, 2 East 61st, New York City, 4th floor meeting rooms.